The potential of messaging as a mainstream support channel cannot be denied. An estimated 90% of Internet users will be on at least one messaging app by 2018. Additionally, those aged 13 to 24 spend much more time in messaging apps rather than email, according to a recent App Annie report. Businesses need to meet this growing category of customers wherever they are, regardless of channel, in order to meet their expectations of getting their needs addressed quickly. Facebook Messenger, which itself has more than 900 million users, is also fast becoming a destination where customers shop, purchase, and receive important updates. Facebook continues to find innovative ways to help businesses enrich their customers’ journeys through the Messenger Platform. Back in 2015, we were excited to announce our partnership with Facebook to power the initial companies using Businesses on Messenger—Everlane and Zulily—through an integration with our live chat product, Zendesk Chat. We saw great early successes with these initial companies and have since ramped this up to other beta customers. Recently BarkBox, a subscription service for dog owners, started using this beta integration to manage conversations on Messenger and saw their average response times decrease dramatically—from 60 minutes to 4 minutes—even as the number of meaningful conversations doubled. This earned them a “responsive badge” on their Facebook page. Responsive badges assure customers of prompt support and reduce their tendencies to air grievances on a public channel. One of the key innovations announced at this week’s Facebook Developer Conference (F8) was bots for Messenger. We worked with the Messenger team to showcase Spring, another of our beta customers, which is the first business to begin blending automated messages from bots on the Messenger Platform with human interactions powered by Zendesk, to assist customers in shopping directly in Messenger. In the year since we announced our Messenger partnership with Facebook, we’ve been taking a deeper look at how to create the best customer service software for this channel, leading to our own announcement during this year’s F8 conference. 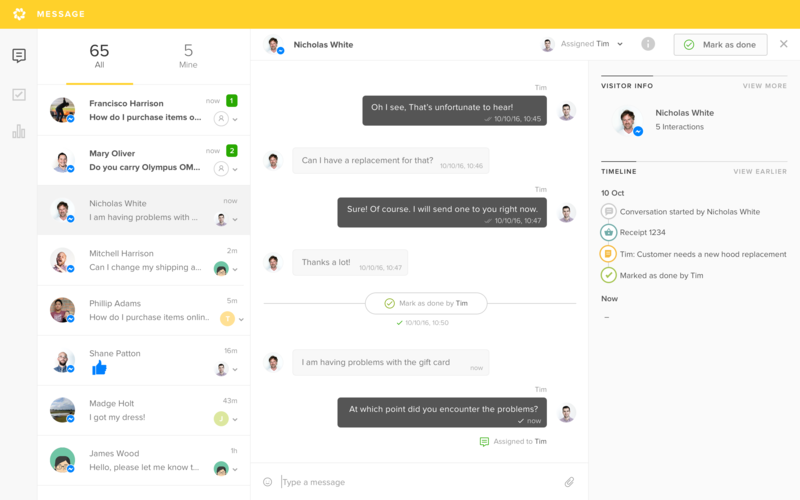 We’re excited to present Zendesk Message, our new messaging product that helps businesses engage customers on their favorite messaging platforms. The Messenger Platform is our first messaging channel integration for the new product. Zendesk Message is easy to use and designed specifically for messaging. Since messaging interactions tend to occur in short bursts, we made it easy for agents to move quickly from one conversation to the next, while keeping it easy to assign, own, and resolve conversations. Agents will be able to easily reference important events in a long conversation stream with features like timeline. Over time, we will continually deepen the integration of Message with the other Zendesk products you know and love. This includes the ability to suggest Help Center answers in Message, dive into Message analytics within BIME, pull chat conversations into Message, and even build chat bots on Zendesk’s marketplace. In building the Messenger integration into Chat, we found consumer behavior on messaging and live chat to be very different. Live chat is like talking to an attentive assistant in a store. It’s fantastic at the point of purchase because a session of quick-fire exchanges can result in a purchase, and the customer can leave the store. This is why live chat software is optimized for an agent to handle a handful of live conversations. But messaging and its mobile-first nature introduces a new paradigm. Messaging is perfect for multi-taskers. Customers fire off messages and move onto other tasks, knowing that they won’t miss the response. There is no ‘on-hold’ anxiety to get an answer instantly. With messaging, we have found that an agent can be assigned many more conversations, and only a small percentage of those conversations will be live at any point. Given these trends, we feel that messaging should be more than an add-on channel for a ticketing, live chat, or social customer service management product. Messaging deserves and requires a dedicated product, which is how Zendesk Message was born. We’re launching an Early Access Program for Zendesk Message and will be selecting companies to join us in defining the future of customer messaging. You can find out more and register your interest at www.zendesk.com/message. If you’re already using Zendesk, reach out to your account manager for more details. In this early phase, we will be prioritizing customers who intend to deploy messaging on a larger scale and who are committed to improving the customer journey using Facebook’s developer tools as mentioned above. The Zendesk Message team is attending the Facebook Developer Conference (F8) today and tomorrow in San Francisco. If you’re there, look for us (hint: we’re dressed in Zendesk green!). This is a blog post about how to use live chat as a channel for customer service and/or sales support. Please visit www.zendesk.com/chat if you’d like to learn more about Zendesk Chat, a live chat software tool that is used by tens of thousands of customers worldwide.